What I love about the default WordPress 2010 theme is its flexibility. 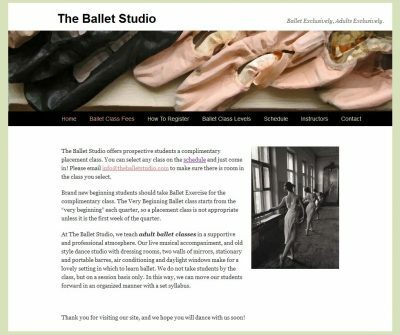 For Maren Erickson’s Ballet Studio in Seattle’s University District, I Photoshopped an image of ballet slippers and pulled in the color pink to create a simple, affordable, and professional small business website. When we decided to take our website to the next level we turned to Marketing by Marlow. We use a very collaborative approach which includes our outside consultants, suppliers and vendors. Scott’s style of management and design meshes well with our team. He brings a high level of expertise, competence and energy to the table while simultaneously listening to others. This is key to the conceptualization of any design and implementation process. He stays current with trends and technology. Above all Scott is super easy to work with and he produces results. We think of Marketing by Marlow as an extension of our marketing and branding activity. We definitely think of Scott as a member of the Skills Inc. family. Cheryl Roe, Director of Programs, Development & Marketing, Skills Inc.